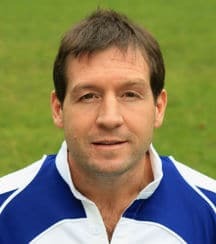 Alain is a former Irish international scrum half and is recognised as one of the best International referees of all time. In his 15 year refereeing career, he took charge of three Heineken Cup Finals and 66 test matches, including the Rugby World Cup Final in Paris in 2007. Alain also worked for over 25 years in the financial industry. His unique experiences at the heart of the action in elite sport while also working as a General Manager in a financial services company he provides compelling insights into developing successful Planning, Communication, Decision Making and Leadership Strategies. As a Business Consultant, Alain has a range of approaches that will upskill your management and sales teams with the skills to excel and get the most out of your employees. His expertise with 25 years in management and running an independent mortgage brokerage for 17 years employing 25 people at its peak, will assist any company increase its bottom line. As a motivational speaker Alain imparts his wealth of experience on and off the pitch as an independent consultant. “The secrets of success in sport and business are similar – the same values apply”, says Alain. He has combined his expertise on the field and in the boardroom to develop a truly unique skillset. His insights into the highly pressurised world of elite sport enable him to share communication and behavioural skills that revolutionise approaches to developing vital skills in managers. Alain gives a 60 minute presentation, 45 minutes of which is on the chosen topic and a 15 minute Q&A session using real life examples. To ensure maximum effectiveness of the presentation, Alain initially will meet with the organization to discuss the key messages that are to be addressed. With an enthusiastic passionate and natural style Alain can instil into his audience trade-mark brand of energy and enthusiasm from his own personal experiences, helping them to confront challenges differently and achieve individual and team success. He shares the secrets of motivation and the importance of planning and inspiring audiences of all sizes. Alain recently made a presentation to a conference Alstom had organised on Railway Safety, with a brief of “making difficult safety decisions under pressure”. “We worked with Alain for our company kick off in 2015. We were bringing the whole company together, in a single location to share strategy and do some team building activities and were looking for an external guest to speak to our group about collaboration and inter country communication. “Alain supported us as a guest speaker in a leadership event we organised with our procurement team. One year later the team still comment on it and how it has helped to develop a high performing team culture. His ability to translate sports scenarios and real life example to business context is outstanding. “Alain was excellent. His presentation was both interesting and very interactive – which kept the audience engaged throughout the session. He presented some very useful business insights using his experience on the rugby pitch. I think everyone came away with something to think about.